represents a noncentral distribution with ν degrees of freedom and noncentrality parameter λ. The probability density for value is proportional to for and zero otherwise. 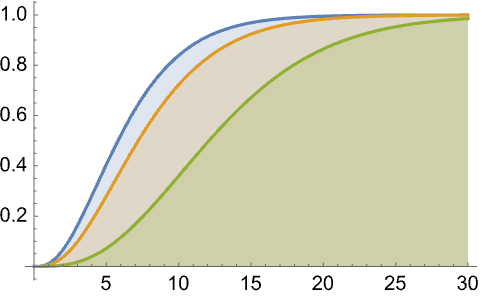 NoncentralChiSquareDistribution allows ν to be any positive real number and λ any non-negative real number. NoncentralChiSquareDistribution allows ν and λ to be dimensionless quantities. 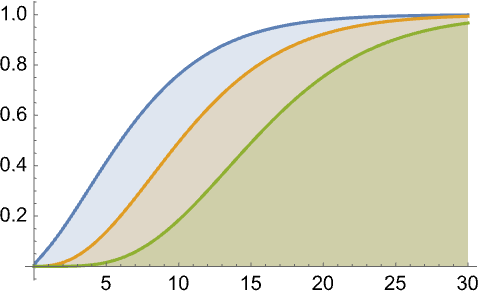 NoncentralChiSquareDistribution[ν,λ] represents a continuous statistical distribution supported over the interval and parametrized by a positive real number ν (the "degrees of freedom") and a non-negative real number λ (called a "noncentrality parameter"). Together, these parameters determine the overall behavior of its probability density function (PDF). 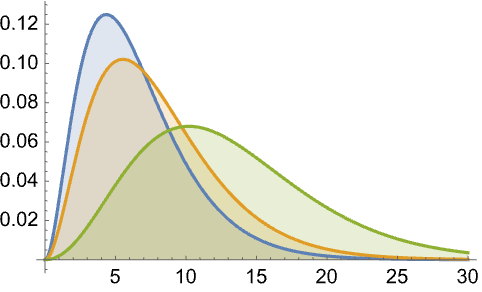 In general, the PDF of a noncentral beta distribution is unimodal with a single "peak" (i.e. a global maximum), though its overall shape (its height, its spread, and the horizontal location of its maximum) is determined by the values of ν and λ . In addition, the tails of the PDF are "thin" in the sense that the PDF decreases exponentially rather than algebraically for large values of . (This behavior can be made quantitatively precise by analyzing the SurvivalFunction of the distribution.) NoncentralChiSquareDistribution is a perhaps-skewed generalization of the ChiSquareDistribution (sometimes referred to as the centralized chi-square distribution), and while it is most often referred to as "the" noncentral chi-square distribution, a number of other noncentral generalizations of the chi-square distribution also exist. Analogous to the chi-square distribution that models the sum of random variates distributed according to a standard normal distribution, the random variate is distributed according to the noncentral chi-square distribution whenever is a collection of normally distributed random variates with unit variances that satisfy . In mathematics, the noncentral chi-square distribution has been used to model the distribution quadratic forms whose constituent summands are independently distributed chi-square variates, while in statistics the distribution is used to analyze tests in which the null variable is chi-square distributed. The distribution has also been utilized to model phenomena in a number of fields including approximation theory, decision modeling, and finance. RandomVariate can be used to give one or more machine- or arbitrary-precision (the latter via the WorkingPrecision option) pseudorandom variates from a noncentral chi-square distribution. Distributed[x,NoncentralChiSquareDistribution[ν,λ]], written more concisely as xNoncentralChiSquareDistribution[ν,λ], can be used to assert that a random variable x is distributed according to a noncentral chi-square distribution. Such an assertion can then be used in functions such as Probability, NProbability, Expectation, and NExpectation. The probability density and cumulative distribution functions for noncentral chi-square distributions may be given using PDF[NoncentralChiSquareDistribution[ν,λ],x] and CDF[NoncentralChiSquareDistribution[ν,λ],x]. The mean, median, variance, raw moments, and central moments may be computed using Mean, Median, Variance, Moment, and CentralMoment, respectively. DistributionFitTest can be used to test if a given dataset is consistent with a noncentral chi-square distribution, EstimatedDistribution to estimate a noncentral chi-square parametric distribution from given data, and FindDistributionParameters to fit data to a noncentral chi-square distribution. ProbabilityPlot can be used to generate a plot of the CDF of given data against the CDF of a symbolic noncentral chi-square distribution, and QuantilePlot to generate a plot of the quantiles of given data against the quantiles of a symbolic noncentral chi-square distribution. TransformedDistribution can be used to represent a transformed noncentral chi-square distribution, CensoredDistribution to represent the distribution of values censored between upper and lower values, and TruncatedDistribution to represent the distribution of values truncated between upper and lower values. CopulaDistribution can be used to build higher-dimensional distributions that contain a noncentral chi-square distribution, and ProductDistribution can be used to compute a joint distribution with independent component distributions involving noncentral chi-square distributions. 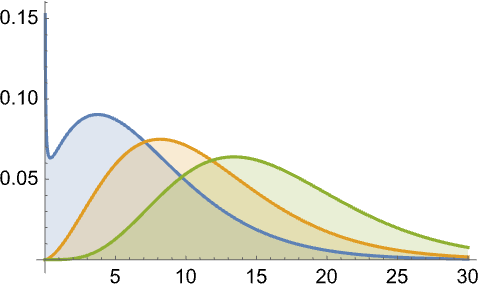 NoncentralChiSquareDistribution is related to a number of other distributions. It is an immediate generalization of ChiSquareDistribution in the sense that the PDF of NoncentralChiSquareDistribution[ν,0] is precisely the same as that of ChiSquareDistribution[ν], and NoncentralChiSquareDistribution can be obtained as a transformation (TransformedDistribution) of several distributions, including NormalDistribution, BeckmannDistribution, RiceDistribution, NoncentralFRatioDistribution, and NoncentralBetaDistribution. NoncentralChiSquareDistribution is a parameter mixture (ParameterMixtureDistribution) of ChiSquareDistribution and PoissonDistribution in the sense that the PDF of NoncentralChiSquareDistribution[ν,λ] is exactly that of ChiSquareDistribution[ν + 2 n] whenever nPoissonDistribution[λ/2], and NoncentralChiSquareDistribution is also closely related to BetaDistribution, BetaPrimeDistribution, StudentTDistribution, and UniformDistribution.